Faith Frable is the Medical Director at Nantucket Cottage Hospital. She attended Middlebury College for undergraduate and the University of Connecticut for medical school. After Family Medicine Residency at Hunterdon Medical Center in Western New Jersey, she started work in a typical private family practice in rural Pennsylvania. She soon discovered that she needed something new. From 2008 until 2011 Faith traveled with her husband and children, to work in Bethel and Kotzebue, Alaska, during the winter and at Nantucket Cottage Hospital during the summer. In Alaska, as the ER doctor, she saw patients in the ER, managed emergency care by telemedicine with village health aides who were located in 11 remote villages, admitted patients to the inpatient service, and delivered babies when a woman came to the ER in labor. After four years of intense experience in Alaska, she and her family settled on Nantucket. 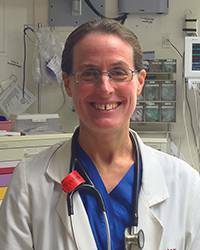 At Nantucket Cottage Hospital, Faith works full-time in the ER and covers hospitalist and pediatric work. Every day there are new and unique challenges related to island life.